From the N1 take the Stellenbosch off ramp (R304) just after the N1 garage. Follow the road for approximately 15kms into Stellenbosch. Turn left onto the R44 (at the Adam St/Bird St traffic lights). Turn right at the next set of traffic lights onto Helshoogte Road (R310). You will see a “Tennantville” sign on a wall on the left hand side of the road. Follow the road and continue accross the next set of traffic lights (Helshoogte Rd/Cluver St). You are now on the Helshoogte pass; continue for approximately 7kms, past Delaire Graff Estate (right) and Tokara (left). MolenVliet Wine & Guest Estate is on the right hand side as the pass starts to descend. From the N2 take the Stellenbosch (R310)/Baden Powell offramp. 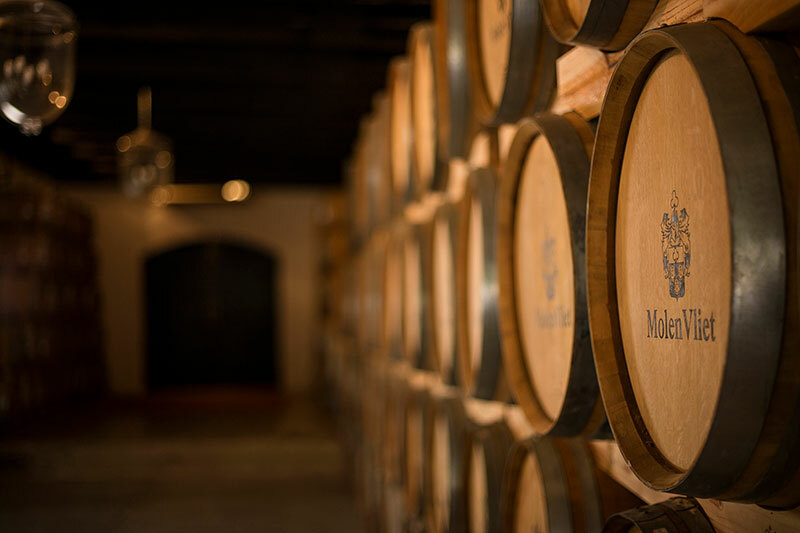 Follow the road past Spier Wine Estate until you reach a T-junction. 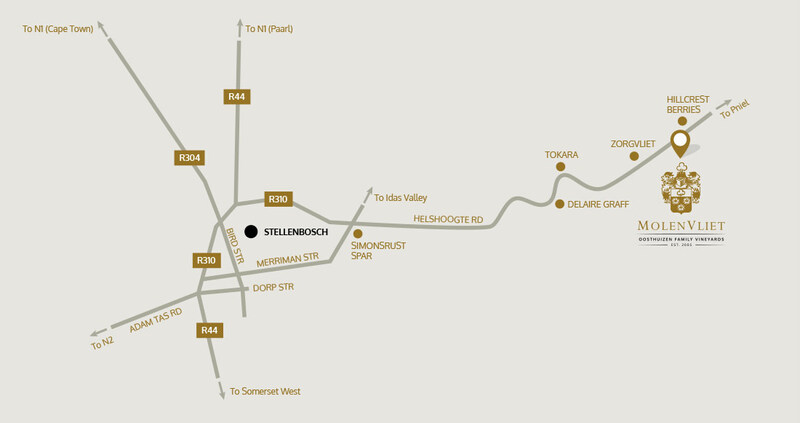 Turn right towards Stellenbosch and follow the road past Distell Estate. Continue past Stellenbsoch station, staying in the left lane. Keep left and at the second traffic light (Merriman St), turn right. Continue up Merriman St until the traffic circle. Turn left at the circle into Cluver Rd. Continue to the next set of traffic lights and turn right into the Helshoogte Pass. Continue for approximately 7kms past Delaire Graff Estate (right) and Tokara (left). MolenVliet is on the right hand side as the pass starts to descend. Take the Strand road (R44) past the Lord Charles hotel towards Stellenbosch. Drive through the Strand St/Dorp St intersection and turn right into Merriman Lane (the third set of traffic lights from the just-mentioned intersection). Continue up Merriman St until the traffic circle. Turn left at the circle into Cluver Rd. Continue to the second set of traffic lights and turn right onto the Helshoogte Pass. Continue for approximately 7kms past Delaire Estate (right) and Tokara (left). Take the R45 (past the Paarl nursery) towards Franschoek. 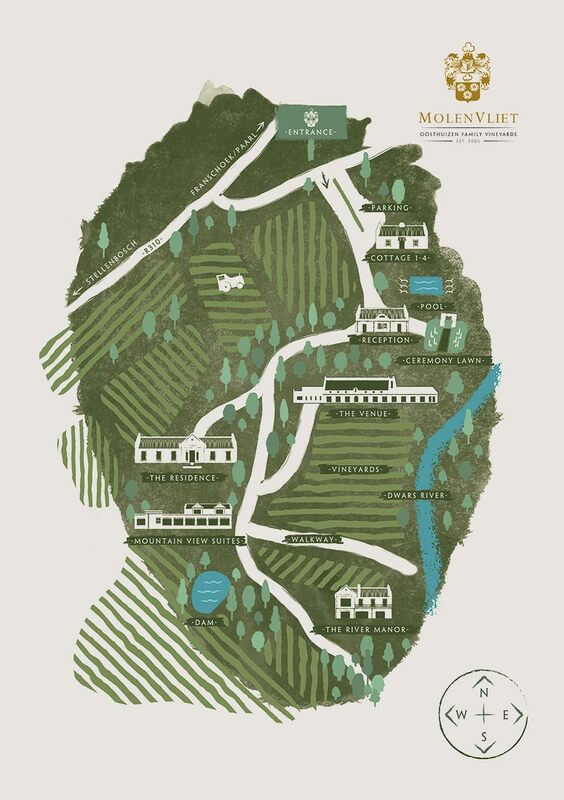 Turn right into the R310, past Boschendal Estate and through Pniel Estate.